Self-sabotaging behaviours, increase self-esteem and build confidence! How can I stop self-sabotaging behaviours, increase my self-esteem and build confidence? 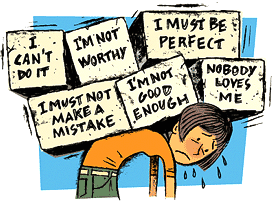 The Voice Dialogue Online Program enables you to understand the origins of low self-esteem and lack of confidence. It gives you a simple, clear strategy for increasing self-esteem, building confidence and leading a happier, more fulfilling life. It never stops, that voice in your head. It has your ear when you stand on the bathroom scales or look in the mirror: “You should lose weight!” it says, “You need to do something about those wrinkles; your hair is a mess!” There are times when nothing you do seems good enough for it: “You should work harder!” “You don’t rest enough!” “You will never be perfect! !” This is the voice of your Inner Critic and in the face of its attack, no wonder you suffer from low self-esteem and lack of confidence. The role of your Inner Critic is to act as a kind of internal policeman and have you follow the rules of your family, society and culture so that you will “fit in” and be accepted. And in today’s world there are more and more rules. Adverts set the standard for how you should look, what you should wear, how you should smell, what you should eat, how you should relax. Films show you the perfect male and female physiques, the perfect way to kiss and make love, the perfect romantic relationship you should have. Personal development programmes exhort you to be more sensitive, more assertive, more sensual, more aware…..
There’s simply no way we can ever live up to all these rules and be perfect. With so many of them to follow, your Inner Critic is in a constant state of anxiety and always on your case. It is easy to see why “should” and “shouldn’t” are two of your Inner Critic’s favourite words - sometimes whispered sotto voce, sometimes bellowed full force. The understandable response to this attack is often to retrench, give up and stop trying. The way to overcome this self-sabotaging behaviour is to learn how to separate from your Inner Critic, find the rules that it is trying to enforce, and then consciously decide whether there is any merit in them. As this happens its voice becomes less strident and absolute. Instead of your foe, your Inner Critic transforms into a trusted adviser and friend, and the self-sabotaging stops. When you have finished, add your score. I wake up at night worried about the mistakes that I have made the day before. I replay conversations after I have had them to see what I’ve done wrong. I don’t like the way my clothes look on me. When I’m with other people, I wonder if they are critical of me. I’m cautious of trying anything new because I’m afraid of looking foolish. I’m afraid people will laugh at me. I often feel inferior to other people. I wish I had a more attractive body. When I look in the mirror, I check to see what’s wrong with me. When I read over something I’ve written, I’m not satisfied with it. I’m afraid there is something basically wrong with me. I compare myself with other people. I seem to attract judgemental people. I question my decisions after I have made them and think that I might have done better. When I say ‘No’ I feel guilty. When I take a test like this, I’m sure that I don’t do as well as other people. I avoid taking risks if I can avoid it. When I think about self-improvement I feel that there is something wrong with me that needs to be fixed. A moderate Inner Critic and therefore good self-esteem. A harsh Inner Critic and low self-esteem. A killer Inner Critic and very low self-esteem. The Inner Critic is just one of several inner voices that can influence our lives in a negative way. This Voice Dialogue Online Program will show you how you can take charge of these voices and lead a less-stressful, more empowered life. You will discover how you can befriend your Inner Critic and deal effectively with the underlying vulnerabilities that fuel its anxiety. This will naturally lead to increased self-esteem and greater confidence. Discover how to deal with negative thoughts. Turn your "Inner Enforcer" into a trusted ally and friend.